Berkeley Earth estimates of the change in average annual global surface air temperature (1966–2015) show that much of the short-term variability in the upward temperature trend is produced by the El Niño/La Niña Southern Oscillation (ENSO), a 2–7 year climate pattern in the tropical Pacific. Average air temperature is affected by many different factors, including: anthropogenic (human-caused) global warming (AGW) that is mainly caused by CO2 emissions from burning fossil fuels; the 11-year solar sunspot cycle; sulfate aerosols from volcanic eruptions; and the periodic ENSO. In this analysis, each year was classified as either an El Niño, La Niña, or ENSO-neutral year based on the average of 3 common ENSO indices. 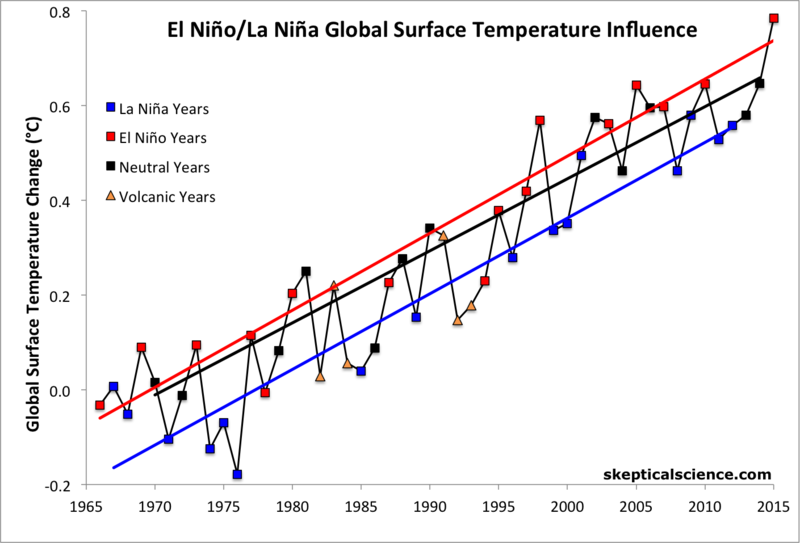 The years were then ranked and the top, middle, and bottom approximately one-third of the ranked years were classified as El Niño, neutral, and La Niña years, as described here. Years that were strongly influenced by the volcanic eruptions of El Chichón (1983–1985) and Mount Pinatubo (1992–1994) were excluded from the analysis due to the temporary cooling effect of volcanic aerosols. First Frame: Berkeley Earth global surface temperature data show a clear increasing trend, but it is "noisy" because multiple influences are present in the data (AGW, ENSO, volcanoes, solar cycle). Middle Frames: Each year is classified according to its ENSO index as either an El Niño year (red), La Niña year (blue), ENSO-neutral year (black), excluding volcanic years (orange triangles). Each category of year is shown with its linear temperature trend. Final Frame: Linear trends are calculated for each category, with the result that after accounting for the variability attributed to ENSO (and removing the effect of volcanic eruptions), each category shows essentially the same underlying global warming trend of 0.15–0.17°C per decade. Short-term cyclical factors like ENSO and the solar cycle average to about zero net effect over time, and volcanic influences are temporary. Climate contrarians sometimes claim that global warming has somehow magically stopped in recent years based on their "cherry picking" short time periods of reduced temperature increase. However, in reality there was a preponderance of El Niño events in the 1990s and a preponderance of La Niña events since 2000, where the former cause short-term surface warming and the latter cause short-term cooling. Accounting for the El Niño/La Niña influence clarifies that human-caused global warming continues unabated. Was 2012 the Hottest La Niña Year on Record?